6% magnesium sulphate – 5 mls, IV 5 min bolus followed by 5 mls over 1 hour – given weekly 3- 11 times. Dropped VAS by 3 points half the time. give subcut or intradermal -concentrate on spots that will induce pain – inject about 1 cm apart – withdraw syringe plunger before withdrawing from skin or will lose a drop of botox each time. I would use 100 units facial areas and perhaps 200 units larger areas though much less has been documented for use. I found my best Botox results were if I combined it with semineurolytic local injected into one or in case of thorax, several rib levels. Use a 30 guage needle if possible, as less likely to cause lung puncture. Spinal lidocaine – that’s 5% lidocaine with 7.5% dextrose (glucose) . – Can use 1.5 – 2.5 mls without much systemic effects (the dextrose appears to delay absorption). Ideally you would like to hit a nerve so it zings across somewhere but that only happens 1/2 the time. Put 0.5 ml in each spot. Do not inject near the spine and near the cervical spine it can kill. I autoclave own lidocaine and add glucose from 50% glucose injectable. Clin J Pain. 2001 Dec;17(4):323-6. High-concentration tetracaine for the management of trigeminal neuralgia: quantitative assessment of sensory function after peripheral nerve block. The Pontocaine comes in 20 mg dry powder vials. I put 0.5 mls spinal lidocaine in it and dissolve the powder, making it 4% tetracaine. This leaves you enough for injecting one site but will leave a long-lasting numbness in area. I have a patient with widespread metastases, including a lower left anterior rib. I injected 4% tetracaine in spinal lidocaine to site and he has had no need for painkillers since – the area is numb. Post herpetic neuralgia often involves 3 spinal levels (cross talk) so you are stuck with spinal lidocaine. I warn the patient it might take several sessions to get a good take – where all areas are done , and the might need redoing in several weeks after. However, it diminishes with time. I was at a course on use of ultrasound for injections and on doppler one can easily see neurovascular nerve bundles one is after – for peripheral skin sensory nerves – just a thought. Korean J Anesthesiol. 2010 Mar;58(3):311-7. Epub 2010 Mar 29. 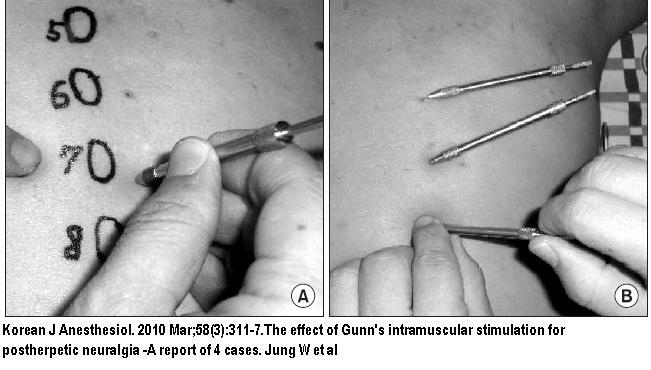 The effect of Gunn’s intramuscular stimulation for postherpetic neuralgia -A report of 4 cases-. Post Hernia Surgery Helped by TENS and Should Surgeons be Doing Hernia Repairs if They do Not Know How to Deal with the Persistent Pain Afterwards? Above you can see the paraspinous multifidi placement. I needle and electrically stimulate them and then stroke up and down over them until I feel a relaxation and patient senses relief. Do all tender levels – then do muscle knots around the side and massage them out. 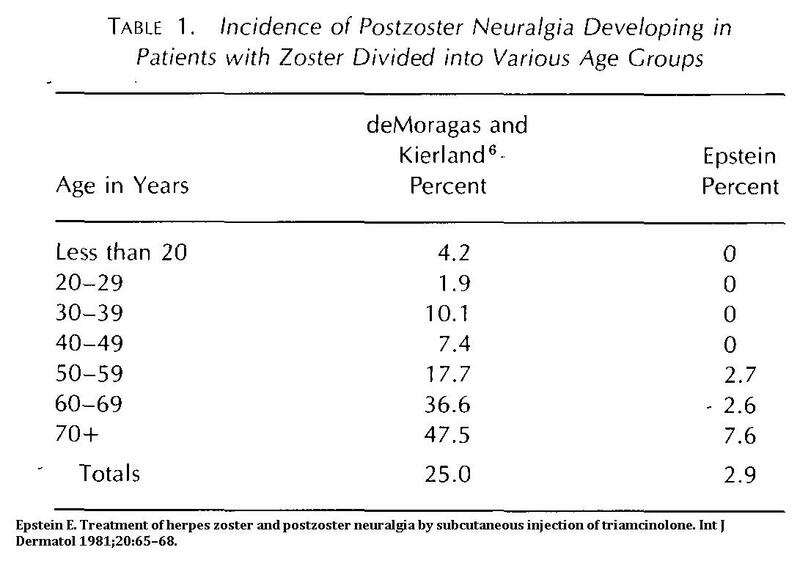 Treatment of herpes zoster and postzoster neuralgia by subcutaneous injection of triamcinolone. he got excellent results though it was unethical for him to not treat some patients and use them as a control group – he didn’t need to – there was plenty of stats on persistent Post herpetic neuralgia rates available. No standardized treatment of steroid to local tissues has developed. I know our local pain anesthetist, Dr. Lang, thinks highly of local injections. He took a 5 ml vial triamcinolone 40 mg/ml. and diluted it up to 100 mls with normal saline to make a 2 mg/ml injection. “injected subcutaneously (with a 25-gauge 5/8-inch needle)… under sites of pain, burning, or itching. A pressure syringe is required on the scalp or in areas of advanced scarring. The usual dose is 60 mg (30 ml) daily. This dose has not been exceeded. The injections are repeated daily until the desired results are obtained. However, little additional benefit can be anticipated after the initial 12 to 14 treatments. It requires two to three daily injections to infiltrate an extensive area even once. Therefore, the figures regarding the number of injections are misleading. There is rampant peripheral neurogenic inflammation going on and at least using 0.25% lidocaine or more would be indicated. I think Dr. Epstein was seeing some of the very worst cases and am hoping such a large area like he was describing isn’t as common in a general practice location – maybe put 20 mg triamcinolone in 10 mls lidocaine and inject subcut to worst areas ( or double that if extensive). I pick up the skin and pinch it – areas that are sore are hence injected after skin roll assessment. I cannot see the advantage of daily injections until you can see the results of prior so would give injects q5-7 days + at least. 6) Cryotherapy of local tender areas – I have not needed to do this for many years now but found it effective particularly for the sharp pains. Suzuki H, Ogawa S, Nakagawa H, et al. 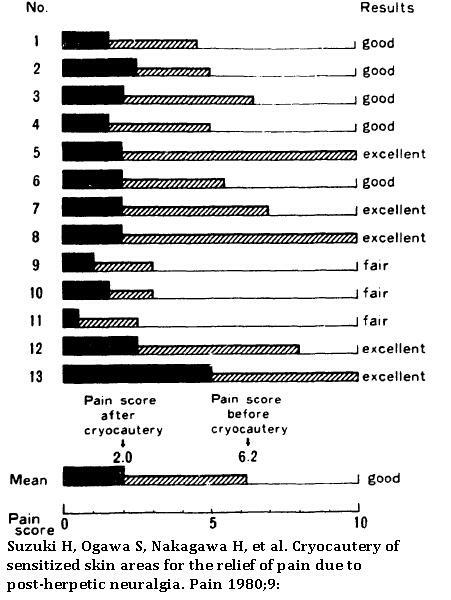 Cryocautery of sensitized skin areas for the relief of pain due to post-herpetic neuralgia. They took a 1 cm diameter dry ice stick and held it on tender site for 1 minute- maybe doing 2-3 sites at a time. I would consider giving local to area first. At time, I used liquid nitrogen with a sigmoidoscope swab and held until good and cold – you want to create a 2nd – 3rd degree burn that blisters up and heals over with loss of pigment. 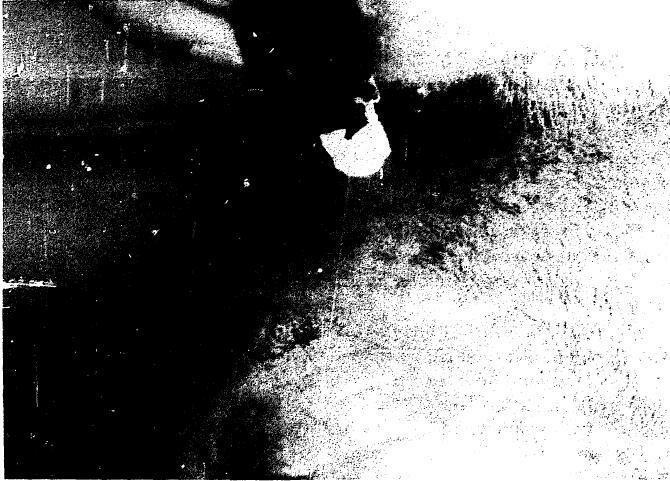 – when frozen, the area would be a hard white indented crater. There were sites just on the edge of previously treated that needed attention and on average, 8.1 treatments, done at 2-3 week intervals (when old ones healed), were done. Nowadays, one could use an agent like a can of Freeze-off with repeated applications to achieve a very cold indented area about 1 cm in size. Again, this technique got very little press – it was from Japan and did not have a control group. I was at a pain congress at the time and mentioned my results. Someone said it could be placebo effect and I answered that I didn’t think the resolution of sharp jabbing pains could be subject to placebo and got a murmur of agreement from the audience. It was only mentioned in passing in the neurologist review article mentioned above. – Trust neurologists to pass this by – they probably never tried it. Am J Hosp Palliat Care. 2010 Feb;27(1):59-62. Epub 2009 Aug 21. 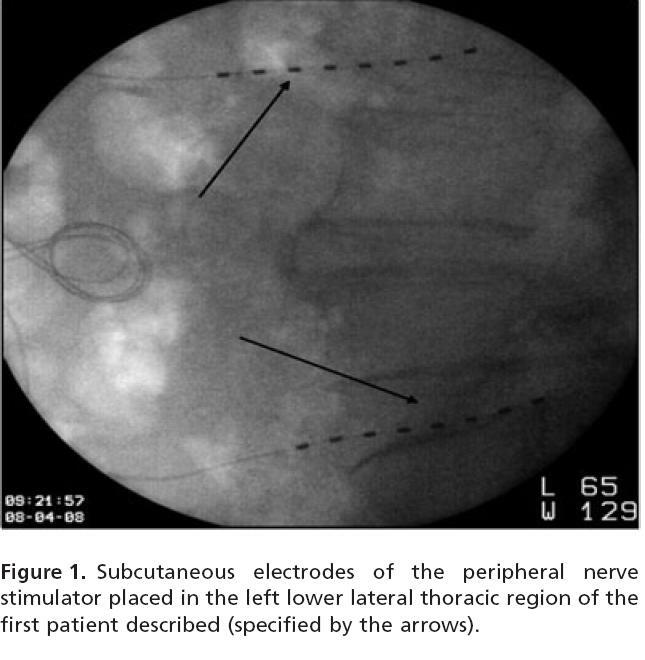 Successful treatment of an intractable postherpetic neuralgia (PHN) using peripheral nerve field stimulation (PNFS). Pain Pract. 2009 May-Jun;9(3):225-9. Epub 2009 Feb 15. Peripheral subcutaneous stimulation for the treatment of intractable postherpetic neuralgia: two case reports and literature review. Diclofenac Patch for Neck Pain – Could One Make Their Own Patches? and pour on tinfoil for use. One would need to numb the area prior to user either injectably or by topical emla patch. 9) I have not discussed the common oral and topical treatments because they are often well known. This entry was posted in post herpetic neuralgia. Bookmark the permalink. what you have accumulated right here, definitely like what you’re saying and the way through which you assert it. You’ve taken the effort to make it simultaneously entertaining and intelligent.